Goals: To obey his father, like a good boy. In AGE 780, following the Tournament of Power and Freeza's subsequent resurrection, the tyrant returned to his evil ways and would proceed to begin the process of (attempting) to restore his organization to its former glory. The Planet Sharking soldiers are offered a monetary incentive as a reward for every new recruit. The ragtag duo, Cheelye and Lemo, happen to pick up a distress signal as they pass by Vampa. The two land and quickly locate Paragus and Broli. Paragus is eager to be rescued, and delivering such a promising recruit like Broli to Freeza is sure to net them a huge reward. Freeza is both surprised and annoyed to learn even more Saiyans survived his destruction of Planet Vegeta. When questioned about Broli's missing tail, Paragus reveals that his son wasn't able to control himself after transforming. It was simply too dangerous to leave it in tact, so he removed it. This piques Freeza's curiosity, who presses further about Broli's control issues. Paragus reluctantly explains that Broli can rarely lose control of himself, as evident from the scare upon his aged body. He constructed the shock collar out of parts from their damaged ships to help render him submissive during those episodes. Freeza proceeds to tell Paragus about the demise of Planet Vegeta, which Lemo had already filled him in on during the trip. He's sorely disappointed that his dream of revenge against the king was stolen from him. The manipulative tyrant smiles as he bestows the good news. The Saiyan Prince survived as well. Paragus is delighted. Freeza explains that the prince and another Saiyan named Goku are currently living on a frontier planet called Earth. Freeza is happy to help him get his revenge against the royal family, so long as they leave Son Goku's final execution for him. Paragus has no issue with that request. Freeza muses to himself that he's happened upon another chance for revenge, and he won't even have to get his hands dirty this time...! For a long time, I really disliked the (old) Broli. Partially because of his character, partially because of his fans, and partially because of his transformation. Specifically the "Legendary Super Saiyan" form, or at least the name. It really served no purpose other than to confuse fans by suggesting that the original golden/blonde/yellow Super Saiyan transformation Toriyama created for Goku wasn't the one the legend was based upon. Which is ridiculous, since everything Toriyama has said before and after states the opposite. However, with the introduction of Kale in a Universe where the Saiyans had no legend to begin with and Toriyama himself tackling his (newer, and better) version of Broli in the 20th movie, the form can be reevaluated for what it is without the stigma of the name. There are quite a few inconsistencies between old Broli, new Broli, anime Kale and manga Kale's various transformations. It's a bit of a mess and I'm going to attempt to try and sort it all out for my future material. Also, for the record, names under the "Showcased Transformations" section are potentially tentative. Promotional material for new Broli coins his iconic form as "Super Saiyan (Full Power)", while Kale is labeled with "Super Saiyan (Berserk)". For the time being, I'm just going to stick with my "Berserk Super Saiyan" name for the form until something official (maybe) tries to clear all this up. PS. Some years for events have been altered from the film's information to better fit with the project. The series of submissions labeled under the title of DB Redux are part of fan rewrite of the official series. Anything that you see in the art or description that varies from the original manga or anime sources is most likely intentional. While I appreciate that you are taking the time to look at my gallery and notice these differences, I do not require a comment on what needs correcting because it wasn't "originally like that". Thank you, and please enjoy! Dragon Ball (Z, GT, etc. ), copyright to Toriyama Akira, Shueisha, Toei Animation, etc. Is that how tall Broly is compared to Goku? 6'9"? I've actually been trying to figure that out along with Frieza. 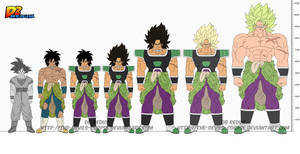 I'd assume that the Universal Emperor is about 5 feet tall or 4.
why is there 2 ikari broly forms? I dont know if Broly is in SSJ form or he is in legendary super saiyan,cause his literally almost gigantic and his freaking eyes and pupils are gone because they exploded when Broly transforms. It's just Super Saiyan. He's buff because he transforms while in his Enraged/Ozaru state. Out with the Old (Z-Broly), in with the New (Super-Broly)!! He's taller than Marvel's Juggernaut now. Glad you were able to rework Broly into your project. 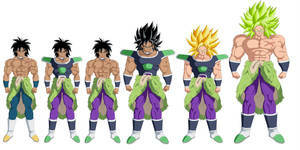 Very nice rendering of Broly in his new duds with your own style. I like the temporary names you have given his various forms/states. Also, providing illustrations that display changes in Broly's size while (kinda) still in his base form gives me a better understanding of how his power is so unique (let me know if I'm wrong in my critique of this piece). I look forward to seeing how you will handle Broly based on how Toriyama is readdressing him in the upcoming movie. As usual, keep up the good work! I Love this! Also are you going to do the same thing you did for Broly for Gogeta? Where your going to change the the look of character and get rid of the old designs. Also if they ever do this again, where they bring back an old movie character and remake him like they did for Broly, which character do want them to bring back and second are you going to do a bunch of back flips to try and add them into the main continuity because honestly if it were me I would just say the old (Z Broly) was from an alternate time line and leave it at that. It's nice to see you post on Deviantart again, I'm personally really interested in how you're gonna handle T.O.P Vegeta since i know from some of your comments that you don't plan on doing SSBE. So i'm curious if you're gonna give Vegeta something else or just leave him with Super Saiyan Blue. You're using the new Broly for this now. Oh hell yes! If Broli is harnessing his Ozaru power in base form, would that stack with super saiyan and his berserk form? I would assume that's the intention even in the official material, seeing how his SS form is huge like his previous enraged state. If it wasn't, he should presumably shrink back down to normal base size...? No idea about the green hair form though, since that increases his size even further. Might just be what that transformation does, regardless of everything before it. Thanks for this. It's certainly an ambitious project you have, and it's nice to see your take on Broly. From what I'm hearing, this version of Broly is more of a fleshed out character than the old version of him. "Like the Title tell us, Broly is the strongest warrior. But if he's the strongest , he can't lose? But the only thing that Broly had is power, while Goku and Vegeta had a family and can die for them. I wanted to manage his loneliness and show that power is not enough to surpass love, friends and connections. Broly almost hurt me. Its a dark Character in the Db universe and I should have fought to impose my conceptions of this character. At the beginning I wanted him to say at the end " Who am I exaclty?" but they cut this sentence. If I could , I should have made him way more interesting." Personally, I liked the original Broly more, since he actually felt more royal in appearance with his golden wristbands and necklace. Being royal was never his point, though. True, but at least he didn't look like a member of Frieza's army. And considering how brutal Broly is while in his Legendary Super Saiyan state, he definitely doesn't serve anyone but himself; Broly literally killed his own father. I love those charts but my only nitpick is the arms maybe make them a bit loose would make the overall aspect better. I find them too tense. Hope you don't take that critic too badly ? The rigid shape is intentional to future proof for potential other costumes later. Other outfits, like the arms of Goku's SAB jacket, look weird if I have to shape them over top more natural shapes when I wasn't keeping them in mind from the start. Ahhhhhhhhhh ok so it's intentional for making your work easy, in this case understandable then. Good luck btw for your project. Maybe add labels under each stage to specify which it is as well. Nice to see you back. I noticed you changed your art style a bit. Personally, I liked the older one more. Also, why did you make the new Broly shorter than the old Broly? Because all the movie and game material I referenced thus far suggests his base is shorter. On the third or fourth transformation he tried to go shopping at this one shopping center and a clerk commented that he didn't even fit down the isles. Broli was like, bro, you haven't even seen... face palm. I see you have made some improvements to your artwork as well. Truth be told, I like this Broly A LOT MORE than the old one. Any reason behind the size increase for Broli's Enraged Ozaru Harnessed form? I haven't decided on a reason for it or anything. Just that the madder he gets in the film, the bigger he grows in that form...like some of the Hulks. So just rolling with it. Is that Saiyan Transformation Chart going to need to be updated again with the Ozaru Harnessed form? Devil, you're back! Nice job, I really like it.